Keep flies away! Have you ever been annoyed by flies circling around you? You might be trying to enjoy your breakfast when an annoying one starts flying around you. You tried shooing them away but they kept on coming back. You tried swatting them with a newspaper but to no avail because they can see your movements with the thousands of visual receptors they have. Flies are not only annoying but they also act as mechanical vectors for many diseases such as cholera, typhoid and dysentery. They carry bacteria on their body and pass them onto your food when they land on the food. It is thus important to keep flies away from us to prevent being infected by these disease-causing bacteria. Flies are attracted to human food and rotting materials. They can find plenty of food sources in your kitchen as it is where you prepare food. Improper management of food waste serves as invitation for their breeding. Since swatting them with a newspaper is not a very effective way to get rid of them, are there any other ways to keep flies away from your kitchen? 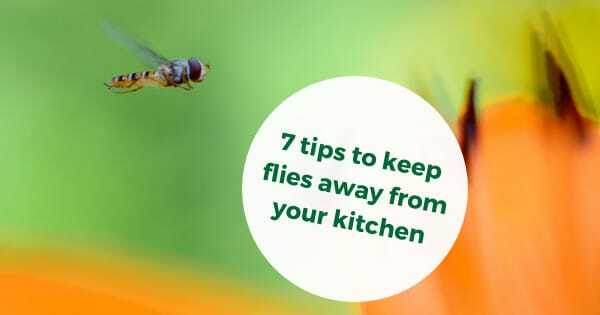 Closing doors and windows is the simplest way to keep flies away from your kitchen. A better option would be to install fly-screens as you can keep flies away without making your kitchen stuffy. Circulating air disrupts the their ability to fly, so using a fan to keep air circulating inside your kitchen helps keep flies away. Flies have a sensitive olfactory system so they will be able to smell food from afar. Make sure that no food is left exposed if you do not want to share your food with flies. By making sure that your food is covered, you can also prevent contamination of food. Do you always leave your dirty dishes in the sink after meals and wash them only after days? Flies love all the food stain and leftovers so your sink that is full of dirty dishes will be the perfect place for the flies to hang out and get food. Cleaning your dishes after meals is a good way to prevent that from happening. It is also good to put your dirty dishes in a dishwasher if you are unable to clean them immediately. A kitchen bin containing rotten food wastes provides ample food source for both adult flies and their young ones. Kitchen bins with your food waste should be emptied daily at the end of day to keep flies away. Like many other insect pests, flies are attracted to moist places so dirty drains provide both moisture and food source for them. To clean your kitchen drain, you can pour vinegar and baking powder into the drain and then flush them with boiling water. Some aromatic herbs are known to repel flies and other insects. Some examples of these insect-repelling herbs are basil, lavender, eucalyptus, lemon balm and thyme. Furthermore, planting these herbs in your kitchen can increase the greenery in your house and also add some extra flavor to your food if you use them in your cooking. Keeping flies away is not really that difficult. By putting in a little effort you can protect your family members from these harmful pests. If you have an established fly infestation around you, you should seek professionals’ help to solve it. Killem provides professional solutions to solve the fly infestation around your property and keep you safe from the pest.